Brorsoft MTS/M2TS Converter as the best AVCHD Converter, MTS Converter or M2TS Converter is the best solution for Sony, Canon, Panasonic, JVC, Leica, etc users to transcode and convert 1080p/1080i/720p AVCHD/AVCHD Lite/MTS/M2TS videos. Click the ? ?Add Video?? button at the top left to select the file(s) you want or just drag-and-drop the files you want directly from your desktop into the main window and remember, you can import multiple files at once thanks to batch conversion. 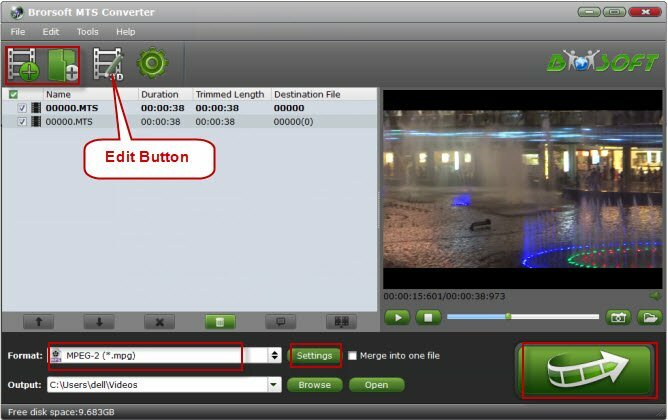 Brorsoft MTS/M2TSConverter provides powerful editing functions so that you can personalize and retouch your videos before converting them. Click the ??Edit?? button and then select a specific function to open the video editing window. As you see, video editing functions like Trim, Crop, Watermark, Effect, Audio editor, adding Subtitle are provided to let you get the user-defined video as you need. Tip: To further customize the output format, please click ??Settings?? button and enter "Profile Settings" window to adjust video and audio parameters. After conversion is done, simply click "Completed" to back to main interface, and click "Open" button to find generated videos. To avoid waiting around for the encoding process, you can tick off the checkbox ? ?Shut down computer after conversion? ?.